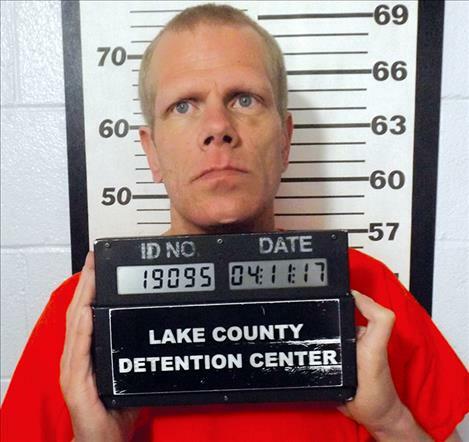 POLSON – A man with a history of violating protective orders has been charged with two more cases against two women, including aggravated assault, theft, criminal endangerment and aggravated kidnapping earlier this year. In the latest incident, Leroy Michael Charles, 40, of Ronan, allegedly beat up a woman at a cabin near Lake Mary Ronan on April 10 and 11, resulting in bruises from her head to her feet. According to a court document, Charles and a woman rented a cabin and proceeded to drink alcohol. At some point an argument ensued and Charles allegedly grabbed the woman and pushed her before she went to the bedroom to sleep. He then woke her up, berated her, knocked her to the floor in a narrow space between the bed and wall and punched her in the head and body multiple times causing her to see flashes of light, according to a court document. Charles then strangled the woman, and she believed she was going to die, the court document states. She scratched him with her fingernails, and Charles eventually allowed her to get up. The document states that at 5 feet, 10 inches and 150 pounds, Charles is heavier and stronger than the woman. According to the document, Charles dragged the woman around the house by her hair, treated her like a dog, demanded she lay naked in a corner multiple times and forced her to crawl under the counter to the kitchen sink several times. At one point, the document states, Charles kicked the woman out of the cabin onto the porch while naked and ordered her to lay on a snow-covered picnic table while yelling profanities at her. He later allegedly grabbed her by the hair and forced her head under running water from the bathtub faucet. The woman said she was terrified for her life and had a difficult time breathing, but was unable to run away due to being naked and because of cold and snowy weather and secluded location. In addition, the court record states that Charles wouldn’t let the woman leave, blocked the door, and threatened further violence if she tried to leave. The next day, Charles drove the woman back to Polson where she reported the incident to police almost immediately and sought medical assistance. Photos reveal dozens of bruises on her body from head to feet and signs of strangulation, the court record states. Charles has a prior protection order violation from 2016 and another one pending, a court record states. He was charged with violating a protective order against another woman on Jan. 20 by calling her. On Jan. 28, he allegedly pushed the woman from the April 10 incident, strangled her and bruised her neck and right arm. A witness in that case said Charles said he was going to kill the woman and took her cell phone. When he left, Charles slammed the screen door so hard that it broke a window and rendered the lock inoperable, according to a court record. He was charged with theft, aggravated assault and criminal mischief in that case and released on his own recognizance. He was later arrested and held on a $250,000 bond due to the most recent charges. His arraignment is pending.